These days a pool is more than just a body of water. 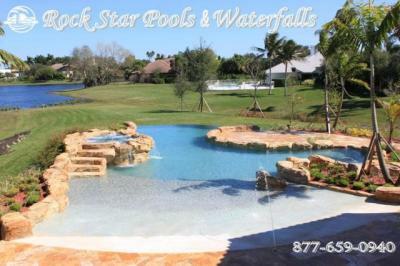 At Rock Star Pools and Waterfalls we are hand crafting the styles that match your dreams. 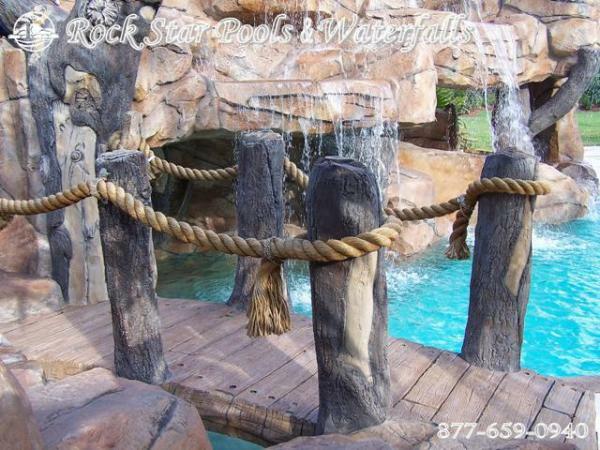 We bring nature to life in your own back yard with unique and exotic features such as caves, waterfalls, slides, spas, swim-up bars, chickee-huts, islands and more. Gone are the days of the basic kidney-bean structure. Instead, we are taking traditional swimming pools and transforming them into the tropical get-aways you have only seen in resorts and hotels. Challenges are what we thrive on and we have even constructed a swimming pool on top of a 15 story parking garage. 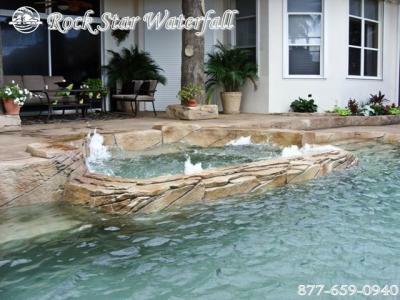 With Rock Star Pools and Waterfalls the issue of space is not a concern. With as little as 14 feet of workable area we can tailor a one of a kind resort-style escape. 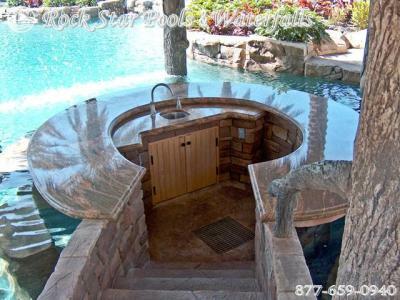 Every pool is custom built with your personal ideas in mind. Not only will you enjoy swimming in one of our creations, you will find that you are rejuvinated by the visual effect of its beauty. 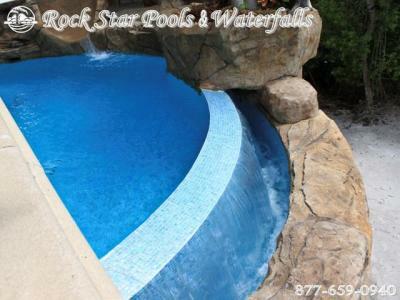 At Rock Star Pools we feel that a design involves creative ideas, experience and most of all owners input. We plan and construct an environment that is visually stimulating and compliments your lifestyle and budget. We utilize the latest computer 3D rendering,hand drawings, and models to create designs and layouts. From initial consultation concept to final build our objective is satisfying our clients. 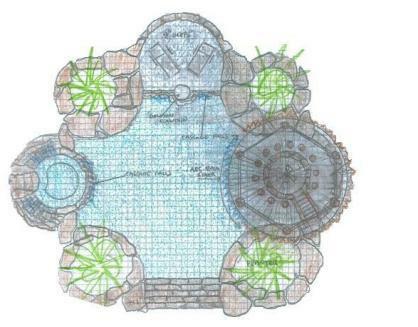 Every clients gets an original plan with that means your project is unique just for you. Pool interior like pebble, glass tile or mosaic tile Give your pool or spa the naturally beautiful look of a pebble-bottomed stream with Stone Scapes! An inviting selection of colors and textures gives you the opportunity to express your own unique style. 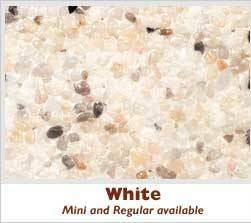 It is the most stain-resistant material and most durable surface available. 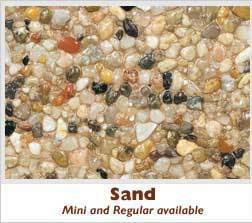 You can expect a new pebble surface to give you 12 to 20 years of good service with proper care. Glass tile will give you elegant not matched by any other product. 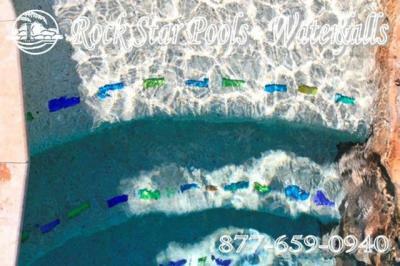 It add a sparkle and color to your pool setting, limited only by the imagination. 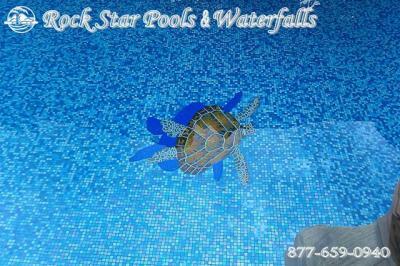 Create an eco -environment with a mosaic coral reef, fish, turtles and other sea elements. The beauty of a vanishing-edge pool is in the illusion it creates. Designed correctly, it appears that water is flowing seamlessly into the horizon. 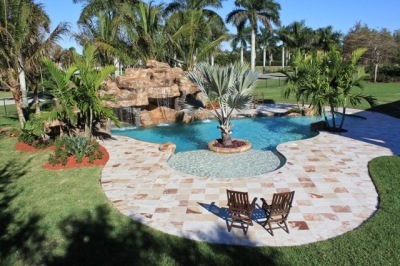 A beach entry is a simulated pool entrance without steps the water comes right up to the deck elevation. A sun deck is a entry into the swimming pool with 8" to 12" of water. Great for relaxing in lounge chairs without getting wet. Add an umbrella for a cool way to get out of the sun. The luxurious Travertine coping and decking line offers a naturally beautiful way to extend your pool / spa decor to the entire backyard. 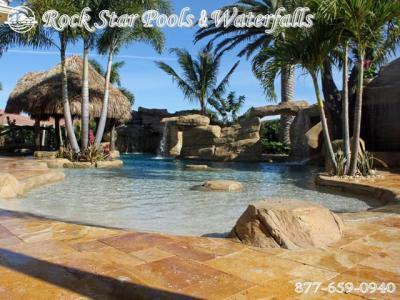 Rock Star gives you the ability to make your pool personalized with Dinosaur, Tiki Heads, and Tree Carvings. 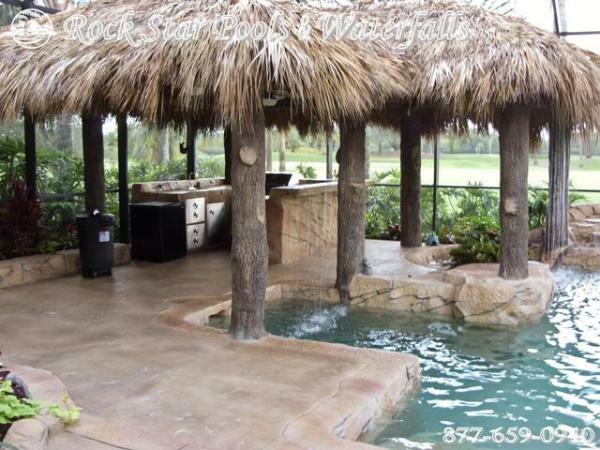 Tiki Huts are the ultimate gathering spot to relax and entertain with family and friends. 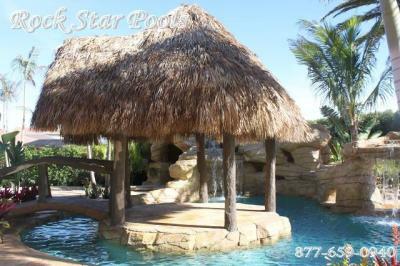 Our Tiki Huts are customized to meet all your needs. 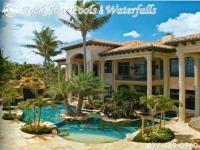 For ultimate resort style living incorporate a bar next to the pool or even directly inside. It can be as simple or elaborate as you'd like. For a complete entertaining area add a barbecue, refrigerator, sink, etc. 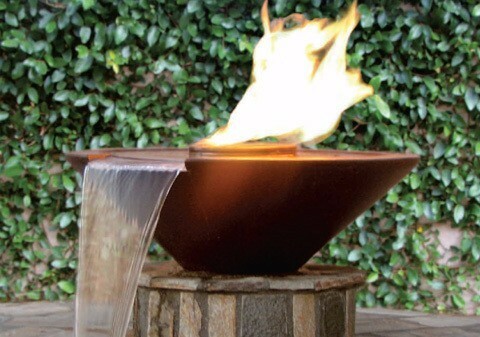 Being able to set the mode with fire brings all the elements of nature together. Having it placed throughout the rockwork makes for a view that undiscernibly. Our Bridges are made from concrete a can be finish with any material the client please. Rock coping will give a lagoon resort style feel to the pool. 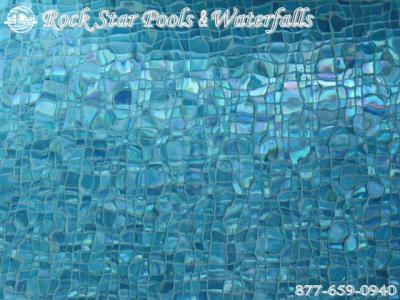 Pool tile gives you a classic look. 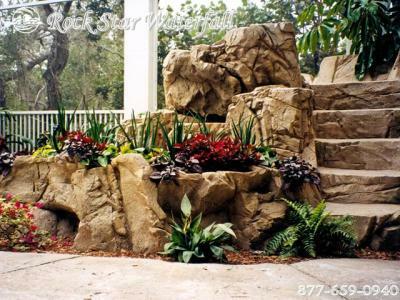 Planters add a natural environment to the waterfall. All planter are installed with water, drains, electric. Utilizing bench and pool to make a table top for food and drinks. Add an umbrella for a shaded, relaxing area.